A couple of days ago, we ventured out of town knowing that bad weather was coming early in the evening that might force us inside the next day. My daughter was recovering from oral surgery, had just started eating solid foods again and was feeling a bit restless. She had been wanting to visit a butterfly museum, Magic Wings Conservatory in Deerfield, Massachusetts so we decided to get out of the house and take the drive to Deerfield with hopes of getting home before the snow started to fly. It was about an hour's drive. It is such a nice place to visit especially in cold weather. 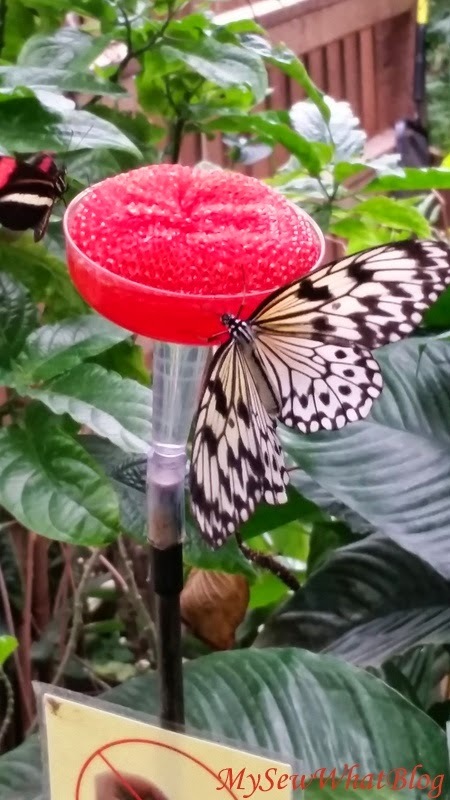 They keep the conservatory at about 80 degrees for the butterflies and other creatures that are on display in their habitats. Besides butterflies there are large turtles, lizards, birds, an iguana and a fish pond with some large koi. There is a beautiful and interesting array of flora as well. I am fascinated by butterflies so they became the focus of my attention and my camera. 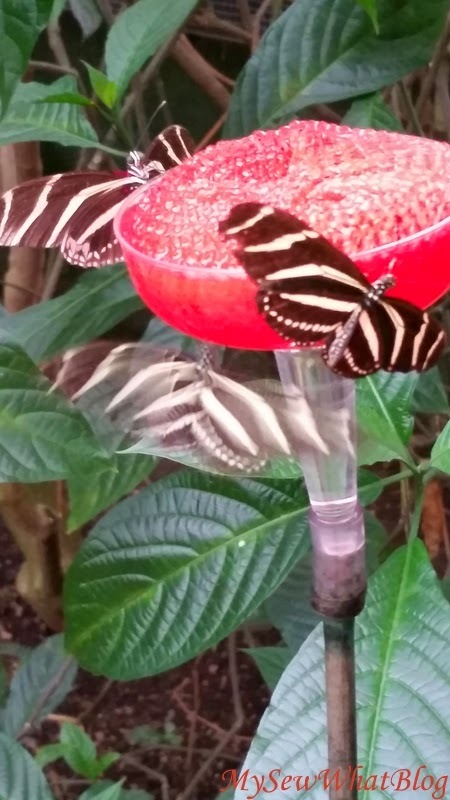 There are many species of butterflies fluttering around the museum; I think I heard someone say about 4000 but please don't quote me. When you walk through the door to enter, you can't help but feel entranced at the flurry of activity. Looking up to the ceiling there are butterflies...... everywhere. As I made my entrance, butterflies flew right at my face. I looked over at my daughter and she was ducking in an attempt to dodge the butterflies flying so close to her. It does take a moment to get used to having them flying around you but swatting is an absolute "no no!" It wasn't long before I was wishing that I had brought my camera but not wanting to carry something around my neck (I have neck problems) I decided to leave it home and use my phone camera. It takes pretty good photos but doesn't do a very good job photographing butterfly action shots. 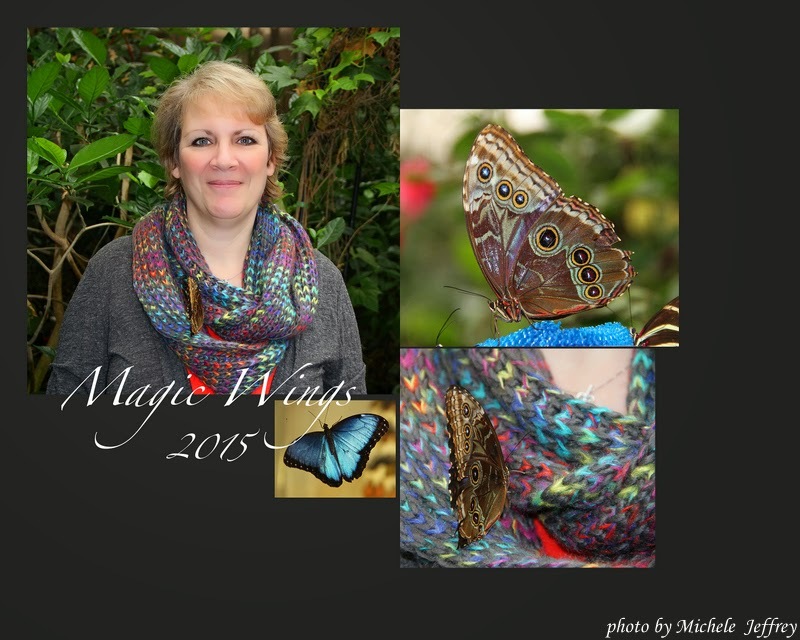 In this photo, you will see that a very large butterfly landed on my scarf. I had been trying to photograph it while it had landed on one of the butterfly feeders. It stayed long enough to photo but it would not open his wings. It was a beauty and wore a most magnificent shade of blue. 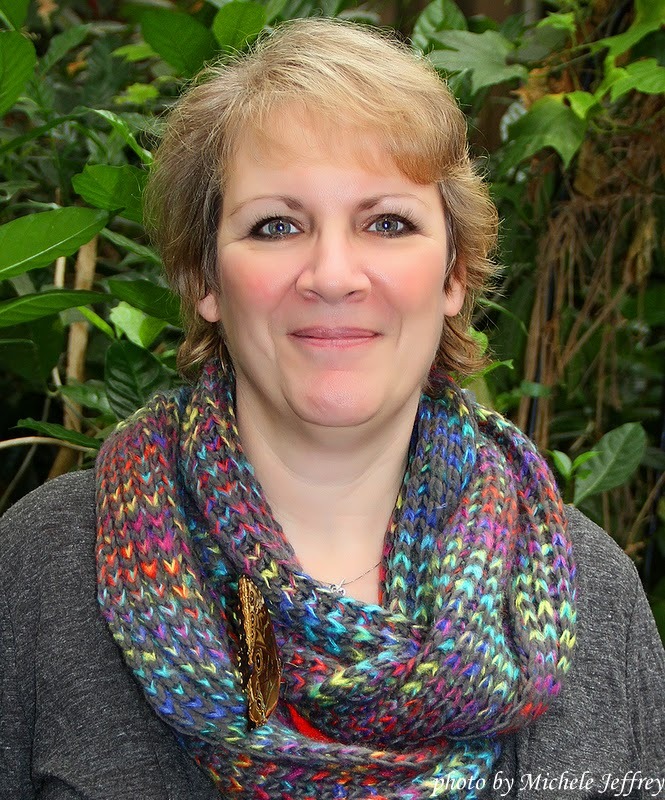 While I was standing there with the butterfly perched on my scarf, a very nice woman (Michele) started taking photos of it. The photo above is one that she took. Unfortunately, it did not open its wings long enough to photograph. She very kindly forwarded pictures by email to me. The butterfly was in no particular hurry to leave me so I walked around with it attached to my scarf for quite some time. I was honored. At one point he opened his wings and my daughter caught the photo below on her phone. Isn't it a beautiful butterfly? I was explaining to my daughter that I had heard it was good luck to have a butterfly land on you so the fact that he was staying attached for so long must certainly mean I was in for some VERY GOOD LUCK! My daughter burst my bubble by informing me that she thought he was just caught in the yarn of my scarf! 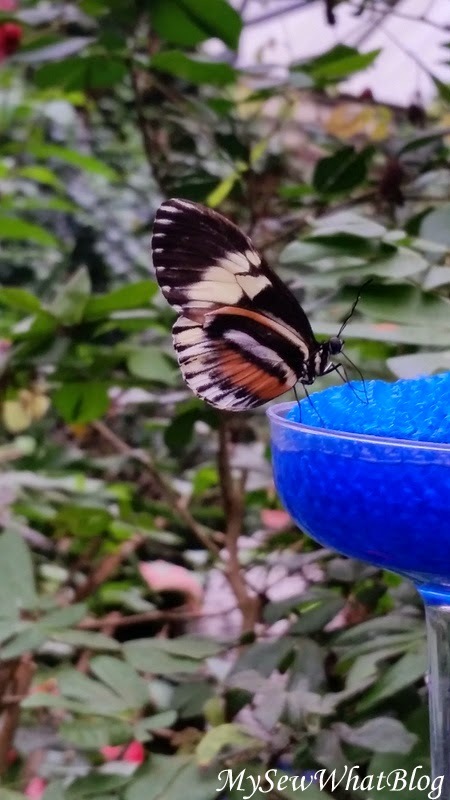 My husband didn't agree with her and he pointed out that the butterfly made no attempt to leave, wasn't fluttering as if he was caught and was along just for the ride. 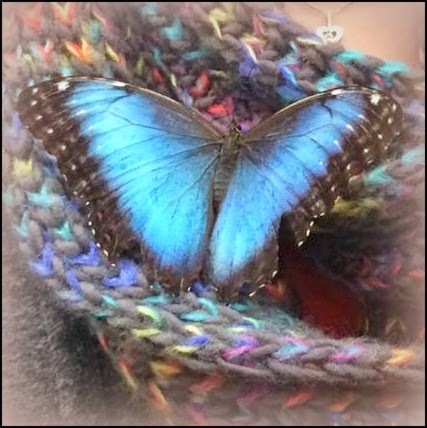 I walked around with my temporary but beautiful blue accessory (it matched the scarf very nicely) for about 15 minutes and then one of the attendants touched him gently and he fluttered away. This is the very nice collage that Michele emailed to me last night. Thank you Michele! 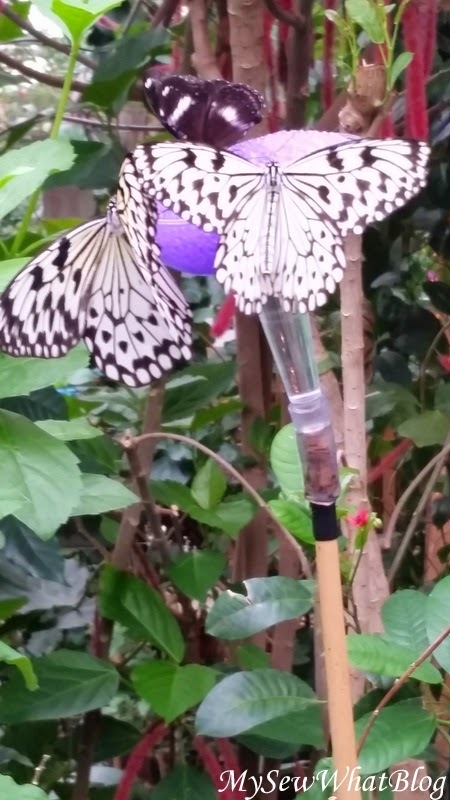 We enjoyed our time at the conservatory and I was delighted that this beautiful butterfly attached himself to me! It turned out to be an experience that was just a little bit magical!